Over the last 10 years, we have seen the rise of the 'Community Energy Movement'. Where communities club together to own their own renewable energy installations as not for profit co-operative societies. Community hydro projects have been prominent across the UK and yield a return for their investors, but also a community benefit fund to be allocated by the members to local good causes. However, the large policy shifts, brought about by the Conservatives, have seen the Feed in Tariff dramatically slashed and alongside removal of tax incentives, the business model for Community Benefit Societies has been overwhelmingly scuppered. Projects that were lucky enough to have reached a certain stage were able to pre-accredit the Feed in tariff last September and there is now a flurry of projects looking to raise funding to install in this last wave of community renewable energy projects. One such project is ‘Greater Manchester Community Renewables’ who has launched a share offer to fund the installation of solar panels at Primrose Hill Primary School in Ordsall, Irlam Primary School in Irlam, and The Fuse in Partington, and to help Moss Community Energy install panels at Fiddlers Lane Primary in Irlam. This will save these sites money, reduce carbon emissions and inspire children (and grown-ups!) to learn about energy and climate change – and surpluses will go into a Community Fund to support eco-friendly projects in the local community. GMCR has a target to raise £186,000 to ensure that all four sites get their solar panels installed, if you would like to support this project please visit www.gmcr.org.uk/invest or search for @WeAreGMCR on Twitter, or take a look at the GMCR page on facebook. Please pass on this email, ‘like’ GMCR on twitter or facebook, the more people who learn about community energy, the better! Despite this shift in policy landscape, there is much talk about how the community energy sector can continue to grow and this report by 10:10 (Community energy – the way forward) makes for some insightful reading. With so many people opposed to fracking, highlighting the fact that we want to move away from fossil fuels, community energy offers a clean and practical alternative! The Piclo trial - a glimpse into our energy future? Since the election last May of the Conservatives, we have seen large scale shifts around energy ‘policy’. An ‘all out’ for unpopular fracking, a push for the mightily expensive Hinckley point and a shift from supporting renewable energy. This has been undertaken under the guise of ‘keeping the lights on’ and ‘lowest cost for hard working families’. ​This is gloomy on a number of levels, the main being that it shows a lack of intent to help shift from the status quo, away from centralised energy plant. This not only jars because it lacks the shift we need to support an energy system built on renewable energy, it also hinders other great leaps that we should and need to be making, especially when it comes to a smarter grid, local demand side response and storage. Sticking to large centralised energy generation fails to capitalise on the wave of digital revolution we are currently riding! The internet of things and the ability of smart technology to reduce waste and balance local grids effectively. Why is this relevant to Hydro? With the demise of the FIT, hydro MUST get a better price for the electricity it generates. Clean, green electricity that doesn’t come laden with the cost of the carbon burden we will be cleaning up for years to come. With small generators unlikely to afford the costs of becoming a licensed energy supplier, what are the options? One exciting trial surely gives us a glimpse into a better, smarter system? Peer to peer renewable energy platform matching generators to SME consumers using Half hourly data. Generator can offer discount or premium tariff. One Hydro generator charged a premium for its electricity post flood. Consumers accepted this premium and still bought the electricity. Potential savings for SME consumers through reduction in Duos charges. DNOs can reduce burden on substation hot spots. Without Government support the industry must look for market based solutions. This could be one of them? Yesterday we announced that we are initiating a new process of horizon scanning. We are doing this because we know the energy system of the future will be very different to the energy system of today. Our role as the energy markets regulator is to protect the interests of existing and future consumers. In order to best fulfil our role we need to understand what is driving system change, the likely impacts on consumers and the implications for regulation. This information will help us set our future priorities for the evolution of regulatory arrangements. For this horizon scanning process to be successful we need your help. This letter explains how you can get involved and what it is that we need from you. If you would like to be involved, please register your interest by sending us an email: energy.futures@ofgem.gov.uk. We’ll then get in touch with more information about the workshops and other channels of communication. Affordability for consumers:– The cost of the FIT is £7/person per year. According to the IMF UK citizens pay £400 pa for fossil fuel subsidies. Hinckley point will receive £92.50/MWh in subsidy, considerably more than hydro, yet in addition, there will be significant clean-up costs. Hydropower schemes run for longer than any nuclear plant and have no toxic legacy. 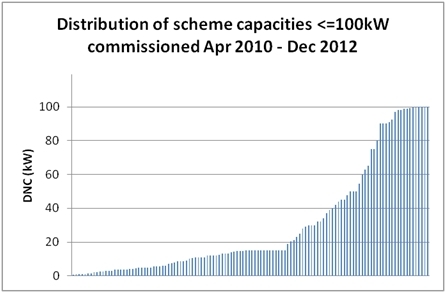 Figures below based on Ofgem reports published 8 January 2016 for schemes which have completed accreditation. 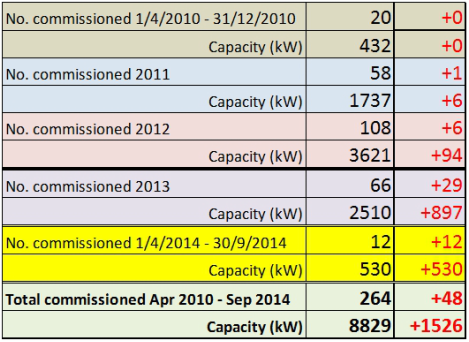 Ofgem have just published the table here, or download this file. This includes the latest rates subject to degression (-5% for schemes with tariff dates after 30/9/2014 and -15.5% for schemes with tariff dates after 31/3/2015 compared with April 2014 rates). We want to do this in a way that minimises the administrative costs whilst still achieving our aims. This is about smarter regulation that reduces the cost to businesses of dealing with the challenges of the future. We also want to make sure we move to a new system in a way that takes into account both current licensed volumes and the amount that abstractors actually take. A registration process will considerably reduce the costs of licensing hydropower abstraction. The SOUTH SOMERSET HYDROPOWER GROUP has issued this paper in response to the EA charges for abstraction consultation. They would like people to lobby their MPs in response to the following email chain, which appears to show that the EA Directors have made decisions on the outcome of the consultation, prior to any evaluation of the consultation responses. Below is a reply received from the EA on behalf of one of the Directors of the SSHG and Mr Battersby's further email to Lord Smith. On examination of the papers sent to the Board, http://www.environment-agency.gov.uk/static/documents/Agenda_and_papers_for_6_February_2014_board_meeting.pdf the only reference that we could find on abstraction charges appear in the income projections for the next three years on page 40, which remain static at £119million per annum. It would appear that the issue of increasing the charges was brought forward under AOB with no forewarning and therefore was an unplanned item for that meeting. If this is correct it is disgraceful and goes against all Corporate Governance best practice. Your help in bringing this latest example of EA arrogance to the notice of Government Ministers would be much appreciated. Email to Lord Smith from Anthony Battersby, Chairman of the Mendip Power Group 18th February. Below is an e-mail I have just received from your Agency. It fills me with alarm and despair. What is the point of going out to consultation, taking up the time of a lot of people who responded, if decisions are going to be taken BEFORE the outcome of the consultation has been published. Did the Board receive a copy of the consultation analysis before its meeting on 6 February? As far as I am aware and as far as the South Somerset Hydropower Group has been told, the consultation had not been analysed by 6 February. To those of us who care about the development of hydro and the reduction in CO2 emissions, this looks like a cynical charade. Hydropower is NOT an abstractive industry and it is outrageous that the EA is treating it as such. It is totally counterproductive to lump hydro, the one activity that actually contributes to reduction in global warming, with activities that significantly generate CO2. It is reasonable that the licence fee should increase in line with inflation. It is not reasonable that it should increase by at least 1,100%, without ANY detailed justification of how such an enormous increase has been calculated. I know you have a lot on your plate but this is an issue which needs your close attention. Thank you for your recent e mail to Richard Leafe. Richard is currently on leave and I hope the following response will help explain the situation and Richard will respond to you on his return. The consultation on abstraction licensing charges closed on 31 December 2013. We presented to our Board proposals to apply an annual subsistence charge or to increase the application charge to those abstractions not incurring an annual charge. Currently applicants for a range of abstraction licences pay a £135 application charge and no ongoing subsistence charge. This level of income falls significantly short of our costs to carry out administrative aspects of receiving, validating and determining an application for these type of abstractions. Also, with the expected large amount of applications for New Authorisations, as a result of the removal of exemptions for some activities, we are facing a significant unfunded burden. Therefore, we must begin to recover the costs of processing and determining these applications; hydropower is one of the sectors affected by our proposals. We are proposing a new higher application charge of £1,500 which is at the lower end of what we believe our costs to be. In line with the view of HM Treasury and Defra we believe it is appropriate that we apply the higher application charge of £1,500 against all licences that do not attract ongoing subsistence charges. Those hydropower operators that already hold licences will not incur this higher application; if they renew on a same terms basis the renewal charge will be £135. The Environment Agency's Board at a meeting on 6 February gave approval for the proposal to introduce a new higher application charge of £1,500 for all abstraction licences that do not attract an ongoing subsistence charge to proceed. Therefore we are currently working with Defra to produce a formal submission covering all proposed changes to go to the Secretary of State for his approval. We envisage that this will progress over the following few weeks to allow us to publish and implement our new charging schemes by 1 April. Defra and Welsh Government have published a joint consultation, Making the most of every drop. If you would like to attend one of these workshops, please email your contact details and venue preference. 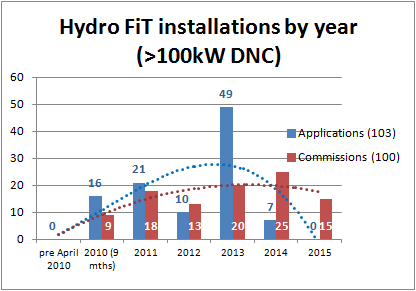 FIT report signals 5% degression for Hydro. 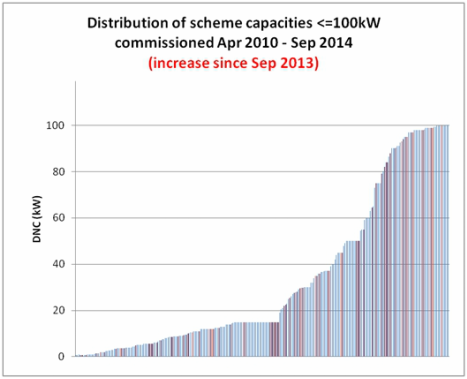 However, there is now a new web page published by government: https://www.gov.uk/government/statistical-data-sets/monthly-mcs-and-roofit-statistics with a spreadsheet which includes accreditations and prelim accreditations, both complete and "pipeline"
It results in 20.348 MW total installed capacity accreditations of which 8.496MW relate to preliminary accreditations. 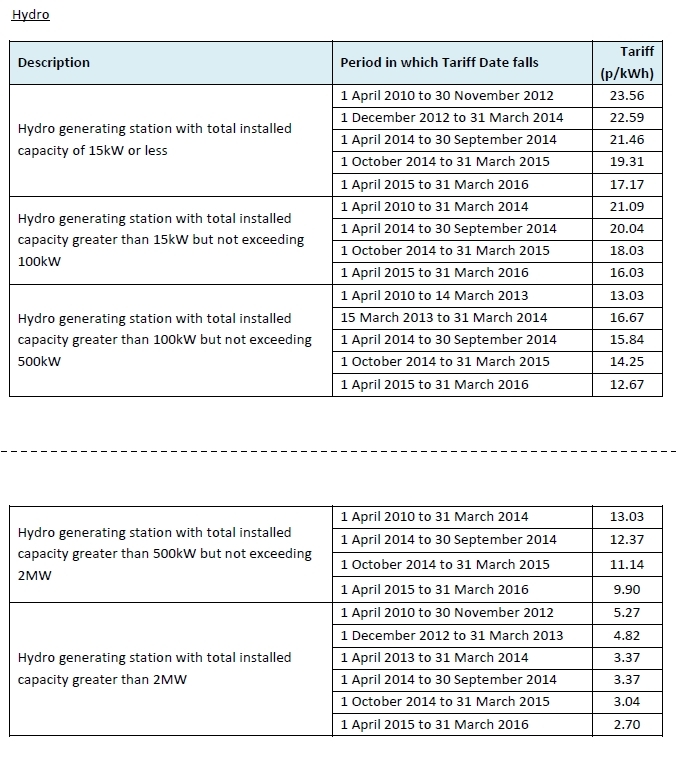 The decision of the Minister (5% degression for hydro because >12.5MW "deployed") has been made, although it would appear that only 11.85MW has in effect been deployed. The MHA will be seeking clarification of this discrepancy. From this point forward, pre-application advice for all new hydropower enquiries will be based on the revised guidance. Twelve weeks after publication, on Tuesday 1 April 2014, the revised guidance will become the basis for determining of permit applications, for any new hydropower schemes received and accepted as valid from that date. I have copied the Latest news items to the News and Discussion topics Page so that you can use the RSS feed which will be updated every time I add news. You can also comment on the news items on the Blog page. The Environment Agency board will be making their decision on whether to accept the recommendations from the Good Practice Guidelines consultation this Thursday 17th October. Board papers can be found here. The MHA will be making a response and posting it, prior to the final meeting We welcome any comments or feedback should you wish to have them included in the MHA response. We will not be attending the final meeting on Thursday, which has now been made an 'open' session, but with no participation allowed. We will update you on the outcome and welcome your comments and feedback! Please be aware that generators now need to keep records as described in the “Open Letter - Feed-in Tariff (FIT): Guidance for Renewable Installations - Change to Statement of FIT Terms”. This is an initiative of the River Energy Networks (REN)/Mendip Power Group, a hydropower association in England which gained an opportunity to send the Secretary of State for Energy, Ed Davey, the top ten problems facing micro hydropower. This could help us all if REN can demonstrate a high number of responses from the industry and potential and actual generators. let all our voices be heard! 23 February 2013 Public tender for a hydropower pre- feasibility study - SW Scotland - see these links for the invitation and the tender document. There is a tight deadline for response. As you know, I have been involved for some time in discussions with departments and agencies on the way micro hydro schemes are regulated and on other matters affecting their development. I have now drafted a paper which proposes ways to lessen the burden both for potential scheme owners and developers, and for agencies and planning authorities. Please contribute your comments and ideas on the mha website by following this link. 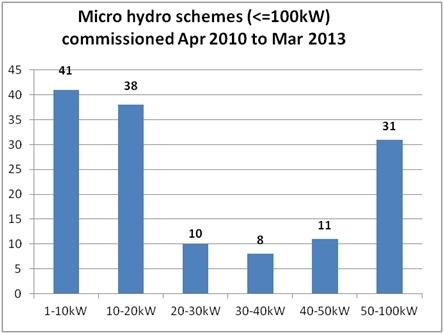 Below are analyses of this data for micro hydro schemes (<=100kW) commissioned from 1 April 2010 to 31 December 2012. The EA has published supplementary notes replacing sections of the GPG1 guidelines in advance of the publication of GPG2 now promised "in the third quarter of 2013". See this blog entry. 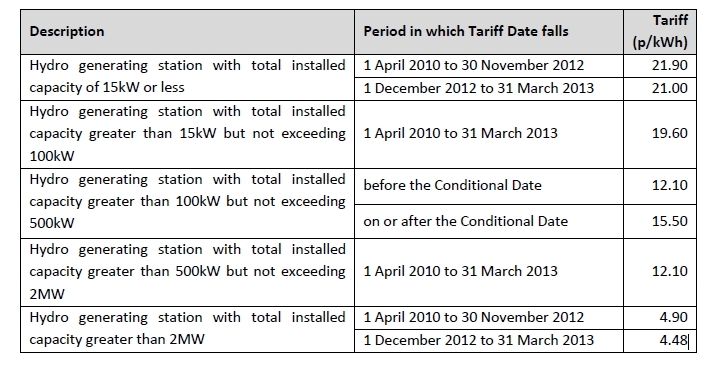 16 October 2012 OFGEM have published the revised Feed-in Tariff table to have effect until 31 March 2013.
way forward. I will post developments on the mha website. As mentioned in the posting opf 21st February below, and following discussions with members of the mha and others, I have prepared a separate document to the formal consultation response containing further ideas for improvements to the FiT. Please see the blog entry and add your comments. Thanks to those who commented on the draft response. I have now submitted a response to this consultation and invite additional comments on Blog page. Please also submit your own responses here: Fees for Planning Applications 2012 Start date 28/03/2012 - End date 22/06/2012. The Environment Agency (England and Wales) have released some of their internal documents which provide guidance to their staff in carrying out abstraction and impoundment licensing processes. I am publishing this list on the mha website here as it is not currently available for access on the EA website and may be useful for applicants, particularly those with high head sites which are not currently covered in the external EA guidelines "GPG1". A consultation has been announced by Gemserv, who run MCS, on guidelines for assessing competencies of individual installers and installation companies. Micro Hydro is covered in the consultation. The consultation ends at 5pm 9 July 2012. 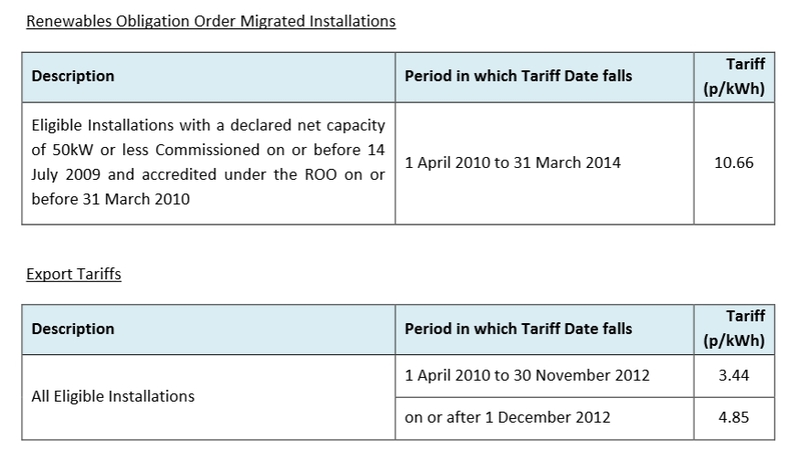 *MCS certification is not available or planned for micro hydro products and installers (though some installers and products have been registered with MCS under "transitional arrangements"); the current DECC Feed-in tariff consultation (see earlier entries) is, however, still considering whether MCS will have some role in certification for micro hydro. I have just discovered that The Scottish Government is consulting on significant changes to SEPA's regulatory regime. I will post a draft response from the Micro Hydro Association and invite comments before making a final submission. See blog entry for more detail. I have updated the draft of 21st February and am inviting comments from mha readers on this page before final submission by 26 April. This is probably the last opportunity for several years to improve the conditions for potential micro hydro developments so please make your comments here or, if lengthy, send me an email. This is so that there is some indication of the support or otherwise from the mha members and others with an interest in micro hydro. The final draft of the mha response can be downloaded here. Ofgem have published a letter inviting comments on transmission issues and their control of pricing. I have offered to assist in the consultation and will be asking for support from members. This could be an opportunity to raise issues micro hydro schemes are having with the restrictions placed by DNOs on embedded generation and with delays and high costs. I attended a roundtable meeting on 9th February where Greg Barker announced the review to representatives from the industries affected by the Feed-in Tariff and invited initial comments. The consultation (link here) is now under way. I will be submitting a response on behalf of the mha and will shortly post a draft here for input from members. Final responses are due by 26 April 2012. "This package of measures is good news for hydro. We are very ambitious for the hydro sector . . ."
I am encouraged that the team at DECC are now taking a more flexible approach to the Feed-in Tariff and that there will be greater certainty and in due course less red tape for micro hydro. ". . . We are intending to announce the outcome of the consultation by 9 February 2012, in time for any resulting legislative changes to come into effect from 1 April 2012. Our aim is that this announcement will be accompanied by a set of reform proposals for the next phase of the comprehensive review of the FITs scheme, which will be the subject of a further consultation. . . ."
For recent news on a wide range of micro hydro schemes and ideas across the world, see this SCOOP-IT site, set up by one of our active members Mike Kerwin. Below is a summary of the key events affecting micro hydro during the year, the activities of the administrator, and some thoughts for the mha’s future. DECC rescheduled the Comprehensive FiT review and associated consultation for the end of 2011 but as yet have neither made an announcement as to its purpose, content, nor given a start date. Given the issues arising from the fast track review of the FiT for solar energy schemes, this leaves it unclear as to the support that all other renewables technologies, including micro hydro, can expect from the FiT in the future. The Scottish agency (SEPA) concluded the consultation on updating their hydropower guidance and the English and Welsh agency (EA) started theirs. In both cases, the agencies are adopting an increasingly precautionary approach, partly owing to heavy pressure from fisheries and angling interests and from Natural England and Scottish Natural Heritage. For micro hydro schemes, the guidance given to landowners and developers often appears to be overkill when considering the very small scale impacts these schemes can have on the environment and ecology of a catchment area, a river basin, or the UK as a whole. SEPA are still reviewing their licensing procedures, establishing “virtual” licensing teams, and tending to follow the guidance to the letter rather than the spirit. The EA have yet to complete their consultation assessment and publish their new guidance for “small and micro scale hydropower”. This is likely to happen in the first quarter of 2012. I am faintly optimistic that there will be some attempt to incorporate a proportionate approach to licensing the smaller scale schemes that the mha and its members are concerned with. The mha has grown from 99 members at the end of 2010 to 135 members at the end of 2011. There are 80 current and potential generators and supporters, and 55 who offer supplies and services. Use of the forum by those who have joined (74) has been very limited and I feel that it has not come into its own. Only 15 of the 74 logged in after joining the forum and 23 were removed after not applying for membership of the mha within 2 weeks. I would welcome views on this, but propose to keep the forum open in case a need arises for the mha to support open discussion. At the start of the year I ended my involvement with development of standards for the Microgeneration Certification Scheme, having comcluded that the approach being taken by DECC/Gemserv was unworkable for hydropower. Later, I contributed to an unofficial review of MCS being undertaken by a consultant to the DECC Minister, Greg Barker. I have asked to see the report but none has been forthcoming. During the year much of my time relating to the mha has been taken up attending meetings with the Environment Agency (England and Wales), mostly by teleconference and occasionally on EA premises. The EA invited the mha, and the British Hydropower Association, to help to steer the EA in its production of an updated set of guidelines for “small and micro scale hydropower”. I have attempted to supplement valuable input from BHA members by constantly drawing the EA’s attention to the absence of proportionate consideration for micro scale schemes and suggesting ways to incorporate this. I have also met with the Scottish environment agency and with a member of the Scottish Office with responsibility for onshore hydro who visited a number of micro hydro schemes recently built and installed in Dumfries & Galloway by mha members. I have maintained the website www.microhydroassociation.co.uk, and established a new parallel site www.microhydroassociation.org to take over when Microsoft switch off the Microsoft Office Live service and cease to host either the mha site or the mha email addresses; this is scheduled for 30 April 2012. For 2012, I invite members to volunteer to take over the administration of the mha as I would like to reduce my involvement. A number of members have suggested that the association should seek some funding for this work which is at present unpaid (by design). Don’t all rush to apply but all offers will be considered! It has also been suggested the mha could itself set up processes to accredit installers and products in the micro hydro sector; an applicant would need to convince existing experienced members of his/her understanding of (micro) hydro design principles and the essential legal requirements for building and installing schemes, as well as possessing, or having access to, the skills needed. Perhaps this could be done in co-operation with an organisation developing training services? 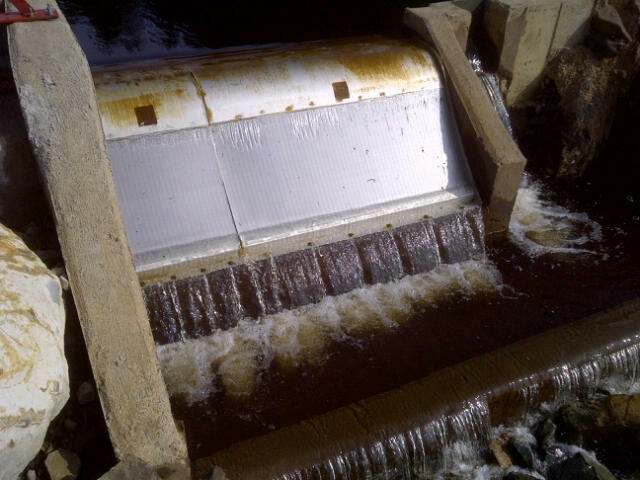 I wish a very Happy New Year to all mha members – may many more micro hydro schemes be commissioned in 2012. My final response to this consultation is here (see entry of 11 November below). Thanks to those who sent in their views which I have tried to incorporate. If you wish to add further comments, you can use the discussion forum. I have been advised of this consultation which runs from 28 Sep 2011 to 21 Dec 2011. Amongst other changes, it proposes a new regime for charging for pre-application advice for abstraction licensing following 15 hours free advice. I have drafted a response here and invite your views before I submit it. I also encourage you to respond to the consultation independently. Here is a copy of the consultation paper. http://www.decc.gov.uk/en/content/cms/meeting_energy/microgen/micro_hydro/micro_hydro.aspx. In essence, this means that until next April, ROO-FIT is sufficient to access FITs. As you know, part of the FITs review work will address alternative accreditation for micro-hydro and something should go out before New Year. Since accreditation is a FITs led issues, not mine, my personal guess is that there will be various options presented to the industry. Accreditation for FITs and standards is one on which Minister said the industry should decide, not DECC. In your position at this stage, I would ensure the industry develops a coherent and informed economic view regarding post-installation certification/accreditation (e.g. Gastec’s), to ensure everyone would prefer that, if it is “offered”. I think it will be useful for the micro hydro community to review carefully the proposition of design and post-installation reviews should this emerge – it will presumably mean a direct cost to the end users but this should give them a better assurance and better transparency than would be the case with the hidden costs of MCS accreditation. "The consultation is the first of two on the comprehensive review of the FITs that were announced at the start of the year (in addition to the fast-track review, which has now been completed). DECC will be publishing a separate consultation around the end of 2011, which will consider other aspects of the scheme including tariffs for other technologies." An EU-funded project Hylow (Hydropower with very low head differences, - see www.hylow.eu and details here) are organising a seminar / workshop on latest developments in low head hydropower at Southampton University on 7th November 2011. DECC have announced a consultation on Renewable Obligations tariffs. These do not affect micro hydro (below 50kW capacity) but may indicate the direction of the Feed-in Tariff consultation also due to take place this autumn. The press notice is here. This consultation closes on 21st October (see entry of 29 September below). This is because it is the Generating Station that is made eligible for the FiT. If a new Generating Station were to be excluded from eligibility it would defeat the combined purposes of the FiT which are both to increase the generation of electricity from renewable resources and to stimulate investment in the infrastructure required. The accredited Generating Station from which Generating Equipment had been removed would no longer be receiving the FiT unless it had been refurbished with replacement Generating Equipment. The South Somerset Hydropower Group and the Mendip Power Group are hosting another of their popular hydropower tours over the weekend of 15th and 16th October. An extra screw turbine is included this time, to add to the variety of sites. You can also see the details on their website at http://www.gantsmill.co.uk/hydropower.htm#tour or download an application form. 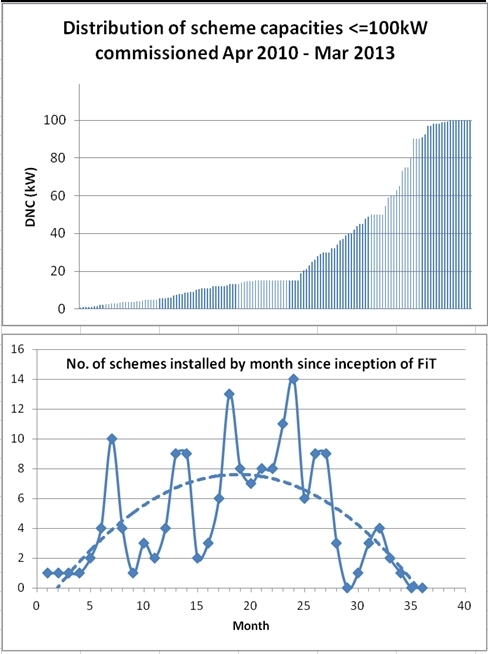 Here are the details of hydro schemes registered for the FiT since 1 April 2010, extracted from OFGEM's latest quarterly report. The consultation for Environment regulation closes on 3 October. There is no legislation or regulation listed for comment that refers specifically to micro hydro, but I have made this submission. There will be another opportunity to comment on Energy legislation and regulation in November - see website: http://www.redtapechallenge.cabinetoffice.gov.uk or send a submission to the Red Tape Challenge Team at redtapechallenge@bis.gsi.gov.uk. This consultation closes on 21st October. It includes consideration of what constitutes hydro scheme plant for the purposes of accreditation under the ROO-FIT process (which is currently running alongside the transitional MCS scheme for access to the Feed-in Tariff - see entry below of 30 July). Thanks to those who have commented on my draft or have made their own responses on-line. My final response from the mha went in today. It is here. I have modified my general comments and have included (red text) detailed comments/modifications I have received from mha members and others. The consultation closes tomorrow 23rd September. After this the EA, supported by the hydro working group, will consider all the responses and issue an updated guidance document – currently rescheduled for the end of February 2012. The EA is also planning shortly to issue interim guidance to their officers on some aspects. I have now drafted a response for comment before I submit it to the EA. I am emailing all members and others to ask people to respond to the consultation and also to let me have views on my draft (MS Word version here, and .pdf version here). The papers referred to in the consultation questions are here: Part 1, and Part 2. I have been involved with the hydropower working group set up by the EA to prepare and run the consultation and will also be submitting a response on behalf of the Micro Hydro Association. I will email members first and post a draft here for comment before I submit this response. This could be an opportunity to illustrate to the government some of the delays and difficulties in planning and environmental application processes as they affect micro hydro schemes. "As you may be aware, the ‘Red Tape Challenge’ was launched in April to open up Government regulation to the scrutiny and challenge of the public, businesses and experts. The website is being used to gather innovative ideas on how the aims of our regulations can be fulfilled in the most successful and least burdensome ways. Ultimately, we hope to encourage greater personal responsibility and remove barriers to growth by freeing up businesses from red tape. . . .
. . . .We are looking for all of our stakeholders – the public, businesses, local authorities, representative bodies and non-governmental organisations – to tell us how our policies are working in practice and what can be done to improve them. The more specific you can be the better – we are looking to make real difference to how our objectives are achieved. Please do comment on the website: http://www.redtapechallenge.cabinetoffice.gov.uk or send a submission to the Red Tape Challenge Team at redtapechallenge@bis.gsi.gov.uk". 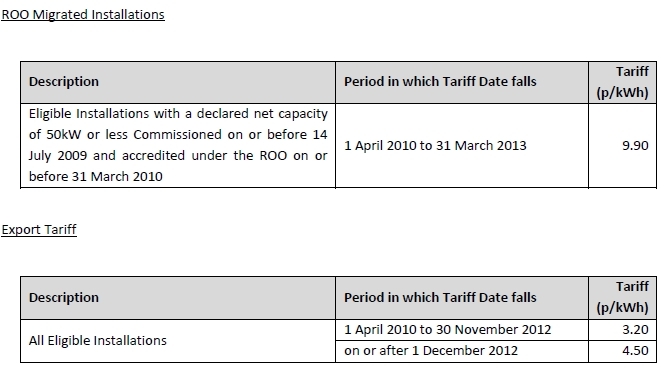 There has been an update from DECC stating that the amendment to the FiT order (no 2) will now extend the "ROO-FIT" period to 31 March 2012, not October 2011 as previously announced. 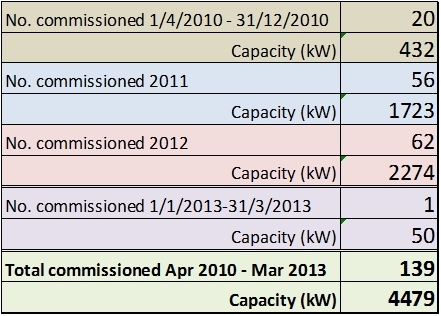 Micro hydro certification and access to Feed-in Tariffs (FITS) In June 2011 the Coalition published a Microgeneration Strategy which proposed to withdraw the exclusive link between micro hydro and the MCS for the purpose of FITs eligibility. It also confirmed that the comprehensive review of FITs is considering how this can be taken forward. We will consult on the comprehensive review later this year. The review will be completed by around the end of 2011 with any resulting changes introduced from April 2012 (unless the review reveals a need for greater urgency). In the meantime, and pending the outcome of the comprehensive review, the Feed-in Tariffs (Specified Maximum Capacity and Functions) (Amendment No. 2) Order 2011 [External link], which was laid in Parliament on 8th July 2011 and will come into force on 1st August 2011, extends the current transitional arrangement. This means that micro-hydro stations (with a capacity of 50kW or less) that are first commissioned between 1st April 2010 and 31st March 2012 will need to be accredited for FITs under the ROO-FIT process, administrated by Ofgem. The EA has published a consultation today. It will run for 12 weeks, closing on 23 September 2011. We and the British Hydropower Association will be considering how best to respond as associations - I will post notes here and email members shortly. There has been announcement today from DECC/Greg Barker Minister of State. Full details of the MCS/FiT link for micro hydro can be found on the DECC website - we are seeking clarification and further details from DECC. 3.19 Micro hydro continues to make progress. Many of the applications are unique but some of the subsystems are repeatable. As Britain acquires knowledge in this and other technology areas, there may be scope to share this information with partners overseas, to the benefit of the UK economy. A specific area for development is to increase the pool of competent engineers. In order to do that, further work is required on developing a competency framework for the micro hydro industry based on agreed industry standards. 3.20 There have been a number of complaints about the impact of micro hydro schemes (systems up to 50kW) on the local environment, and fish in particular. We are keen to encourage sustainable hydro schemes, and the Environment Agency carefully considers all aspects of environmental protection before granting a licence. They are currently updating the Hydro Good Practice Guide together with hydro developers, the fishing community and other stakeholders, and this should be published at the end of the year. 3.21 Responses to the consultation also suggested that MCS is restricting micro hydro development in the UK. MCS does play an important role in the Feed-In Tariff accreditation process in helping to simplify it. However, there is a case to treat micro hydro differently due to the special and complex nature of micro hydro development. We are therefore proposing to withdraw the exclusive link between micro hydro and the MCS for the purpose of the Feed-In Tariff eligibility. We will consider how this can be taken forward as part of comprehensive review of the Feed-In Tariff. I have now met Pauline Silverman of SEPA to discuss the issues raised in my letter to SEPA's chairman. A micro hydro installer Euan McConnell and the local SEPA officer Shona McFarlane also discussed some local schemes. The results of this useful and positive meeting are noted here. the confirmation from SEPA that the limit lower limit of 6% slope in a depleted reach of >1500m is assessed on the length of reach after deducting the lengths of sections with >6% slope. RM34 tests are not made for abstraction applications with an output of less than 0.35GWh/annum passing the standard guidance checklists because the schemes are deemed to have a minimal (unmeasurable) net impact on the environment. 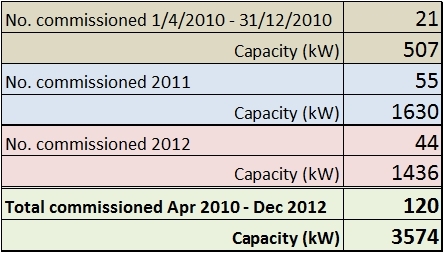 You don’t need to use a MCS product if you first commissioned after 1st April 2010 and the [development] ends before 1st October 2011 for installations below 50kW. You need to check with Ofgem how you register this etc and any other requirements. Provide a transitional arrangement allowing micro-hydro stations (with a capacity of 50kW or less) that are first commissioned between 1st April 2010 and 1st October 2011, to be accredited for FITs under the ROO-FIT process. After this transitional period, the MCS-FIT accreditation process will apply as originally envisaged. Extend by a year the period in which eligible microgenerators (with a capacity of less than 50kW) can notify Ofgem to enable them to transfer from the Renewables Obligation to FITs. Ensure that the original policy intent on FITs and grants is properly reflected, by time limiting the period in which installations that have benefited from a public grant can also be eligible for FITs under the de minimis rules. Attached are extracts from the full amendment order highlighted where relevant for micro hydro generators and installers. The amendments come into force on 30 May 2011. For updates on the work mha members are doing to contribute to the EA's preparation for the public consultation, please join the mha discussion forum and navigate to the topic Environment Agency "Good Practice Guidelines" consultation. More details on the Gantsmill website and here. Q8: Do you have any suggestions or thoughts on the scope of the comprehensive FITs review (by Tuesday 12 April 2011). 7th April 2011 Training for developers? 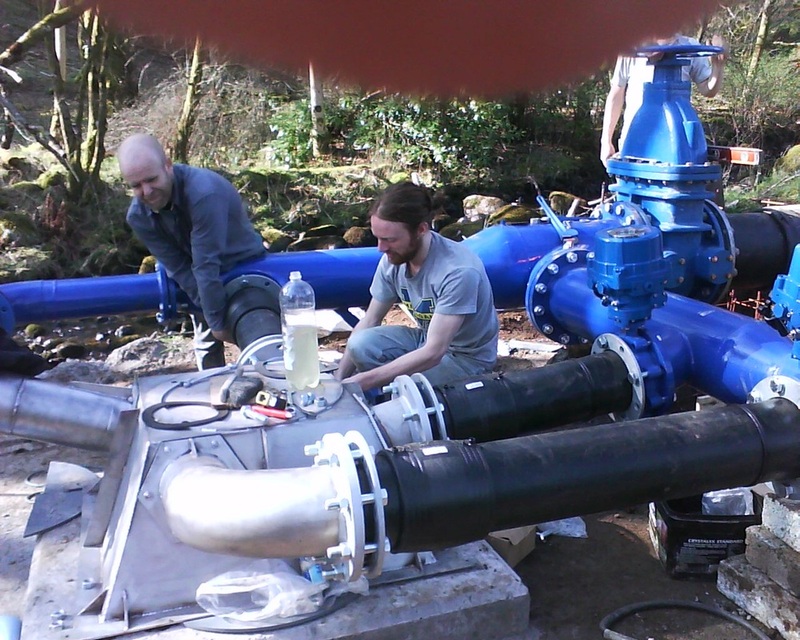 DECC is exploring the issue of a lack of courses and training for micro hydro developers. I have created a topic on the mha forum to encourage others to give thought to the matter. A planning meeting on the Environment Agency consultation on their guidelines took place in london today. I will post further details as they become available, inviting comments and contributions from members. One of the main issues to be addressed is the inclusion of guidelines for high head schemes. Gemserv have released un updated version of the procedures they will follow for certifying hydro products and installers until certification bodies offer certification. 8 March 2011 REMINDER: DECC's Microgeneration Strategy Consultation closes on 16th March Please contribute your views. 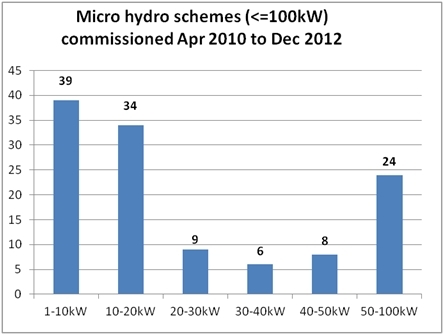 This scheme may help with the initial stages of planning for micro hydro schemes in Scotland from April 2011. A new consultation on HYDROPOWER GOOD PRACTICE GUIDELINES is to be conducted by the EA later this year. The mha has been invited to participate in a working group to precede the full public consultation. If you have experience of using these guidelines, please contact me (mha administrator). There is a new petition on this website. The response to consultees provided by SEPA does not at first sight appear to take into account the comments (part 1 and part 2) made by the 55 people and organisations participating in the consultation. Dr Sue Peppé has analysed the comments in detail and produced a critique and detailed analysis in comparison with the SEPA document and I have written to SEPA with concerns about the consultation process. Thanks to his making a request under the Freedom of Information Act, mha member Euan McConnell has obtained re-publication on the web of information of the National River Flow Archive which was formerly in the public domain. It is now available again on the Centre for Ecology and Hydrology website. 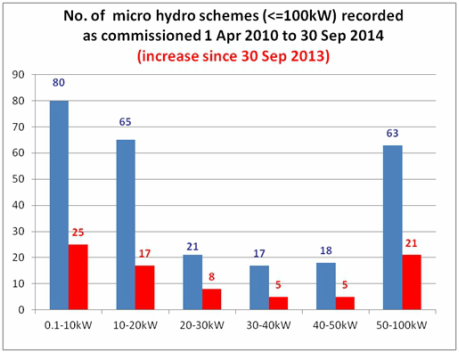 This provides important data for designing micro hydro schemes. SEPA have today posted their response to consultees. Following the publication of the first issues of the installer and product certification standards documents, I have decided to terminate my own involvement in the MCS hydro working group since the management panel responsible for the MCS has made the decision that the standards must be published despite reservations of several experienced members about the content of the standards and their suitability as a basis for certifying installers and products. Instead I intend to focus on initiatives to introduce more suitable alternatives to MCS for the purposes of providing micro hydro schemes with access to the Feed-in Tariff. I shall also continue to add pressure on the Coalition Government to exclude micro hydro pro tem from the MCS requirement. It remains to be seen which certification bodies will offer certification for micro hydro, and I understand that there will still be work done to update the MCS standards. I will therefore attempt to keep in touch with any further work and inform mha members by email or on this website, inviting comment where requested by the MCS team or working group members.It remains to be seen which certification bodies will offer certification for micro hydro. Welcome to Jamie Wallace of Highland Eco Design - our 100th member! 19 January 2011 The first release of the "standard" for MCS Hydro product certification is now available here. 11 months since the mha was formed, membership has reached 99! SEPA have published their guidelines "Guidance for developers of run-of river hydropower schemes". There is no reference anywhere to the fate of the consultation document that was published in March 2010 for comments by 30 April 2010. There is still no information on the website concerning the consultation responses nor any "decision document". I have requested sight of these and asked that they be published. There has been no change in the guidance document since the version of 28th April 2010. In summary, the guidance is still designed for all hydro schemes irrespective of capacity and makes very little reference to micro hydro schemes (under 50kW capacity). I am asking a few members to trial a forum for use by members of the Micro Hydro Association only to raise and answer questions and to discuss current issues. If you are interested in joining the trial, please email me. 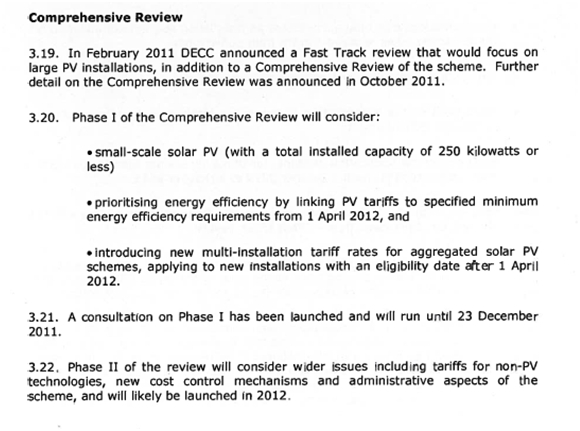 DECC have announced the second stage of their consultation. They had previously stated on their website that a draft strategy would be posted for comment before this stage was undertaken, but despite my formal requests for information about this, I received no response and no draft strategy was published. The document cited in their press release today (see full DECC Press Release) contains some of the output from the working groups on the first stage, but negligible points concerning micro hydro. I have submitted my comments (see entry below for 6th October) a second time but have little confidence that any of these will be considered. It would be good if more people submitted comments to this final stage in case someone might notice that there is a problem. A draft "Hydro Product Standard MCS016" has been circulated by MCS/Gemserv for comment to the MCS hydro working group and stakeholders. This version contains my covering letter and comments. Several members of the Micro Hydro Association have also commented. See Links page information on VAT and Feed-in Tariff/export payments. DECC and Ofgem have updated their advice re Grants and the FiT. MCS have redesigned their site and now include details of governance and proceedings. New entries are now appearing on the Microgeneration Certification Scheme (MCS) website listings of products and installers who are certified under transitional arrangements - turbines include turgos, cross-flow turbines and Archimedean screws - there are 8 suppliers and 10 installers to date. This will mean that micro hydro recently completed or in design/construction stages which use these products and installers will now be able to apply for the Feed-in Tariff (commissioned schemes can be registered on the MCS/Gemserv database only by an installer certified under the MCS; there is as yet no alternative "equivalent" certification process for registering schemes as eligible to receive the Feed-in Tariff). See here for the Government response to the e-petition of earlier this year. "We are informed that he [Greg Barker, Minister of State for Energy and Climate Change] will also make an announcement on schemes which are commissioned between the RO and Feed-in-Tariffs (FITs) but that micro-hydro schemes currently being planned should use approved products and installer companies, listed as 'transitional' on the MCS website www.microgenerationcertification.org. DECC has also confirmed that approved micro-hydro product and installers listed on the MCS website will be eligible for FITs (whatever their status in coming months). We are informed that 18 installers are being assessed for listing by Gemserv, and 7 products, with an increasing number of products expected following the publication of the MCS product standard in November. Further information is available from Gemserv." "DECC is aware that there have been issues regarding accreditation of micro-hydro in the transition to FITs. They are seeking to resolve these and will be making an announcement shortly." Draft letters (for generators, installers, suppliers, associations) have been sent to members and others to lobby MPs concerning the industry letter of 10th October and the Minister of State's response (see previous news below). "The announcement also confirms that the Feed-in Tariffs (FITs) scheme will continue but that tariffs will be revised as part of the planned first review of FITs. This will take place in 2012 and will take effect in April 2013 – or earlier if deployment is higher than expected. We will shortly announce the level of deployment that would trigger an early review. The review of support provided by FITs will be with a view to reducing projected costs in 2014/15 by at least £40 million i.e. 10% to maximise value for money." We expect to follow this up with further representations. The letter may offer a glimmer of hope for people with schemes which were commenced or planned before the introduction of FiTs but not commissioned. See here this letter was sent by several suppliers as a result of concerns that the tariffs may be changed prior to the 2013 review. A letter has been sent to the Minister and to the DECC official responsible for the Feed-in Tariff from 3 associations, including the Micro Hydro Association, and 4 installer companies requesting that micro hydro be withdrawn from the MCS process pro tem and that the micro hydro product standard currently still being drafted be dispensed with. "I imagine the language in the letter is a bit technical for a Minister to understand, and indeed it seems others, as it is followed by notes of explanation. I would urge simple plain english to reach politicians and any detail attached, not vice versa. My version to the Minister, local MP, might be a summary on following lines - ‘Micro hydro generates domestic electricity from small streams by individuals who want to become more energy self sufficient. All they need is an electrical certificate confirming that the meter measuring electricity generation is working correctly. The use of the water is already licensed by Environment agencies. The recent regulatory arrangements which include micro hydro schemes producing very small amounts of electricity are completely unnecessary, and making it impossible for people to undertake them.' "
I have submitted a response to this consultation which seeks to continue with the present planning rules. These requiring micro-hydro schemes to be subject to Local Authority planning consent (except for turbine houses below a certain height). This requirement duplicates other regulation. I have received many enquiries on this. Below is the current status as I understand it. 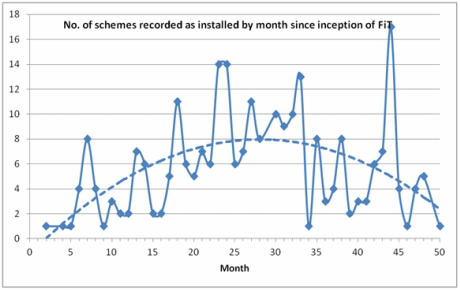 Over six months following the introduction of the Feed-in Tariff, no micro hydro schemes have yet to my knowledge been made eligible for the feed-in tariff. Ofgem refer all enquiries on this from installers, product suppliers and generators to DECC. DECC point to transitional arrangements under which installers and product suppliers can register to obtain provisional certification. Our understanding is that a scheme, once accorded eligibility for FITs under the transitional arrangements, will retain this eligibility irrespective of whether the installer/product supplier does or does not become fully MCS certificated at a later date. However, the consultancy Gemserv, who have been appointed by DECC to administer the MCS certification process, have so far registered just 3 products and 3 installers, and are reported to be unable to give any dates or timescales to installers or product suppliers for when they may become registered or fully certificated. Several micro hydro schemes implemented before July 2009 under the Renewable Obligations Order, and others more recently, are operational but the proprietors and their electricity suppliers do not know whether or when the schemes will be accorded FiT eligibility. Unless an electricity supplier makes a separate commercial agreement with a customer to pay for electricity exported to the grid, there is currently no income available from generation of hydro-electricity. This delay is principally down to the lack of progress in resolving concerns raised by industry players in the MCS process as applied to micro hydro. An installer standard has recently been published (against the advice of several members of the MCS hydro working group) – it is still being modified and updated at this address. A product standard is still under development. However, as yet no certification bodies have indicated that they are ready to certify either installers or products. As previously noted, an alternative “MCS equivalent” scheme for certification bodies to assess FiT eligibility through design and site inspections is under consideration by DECC. 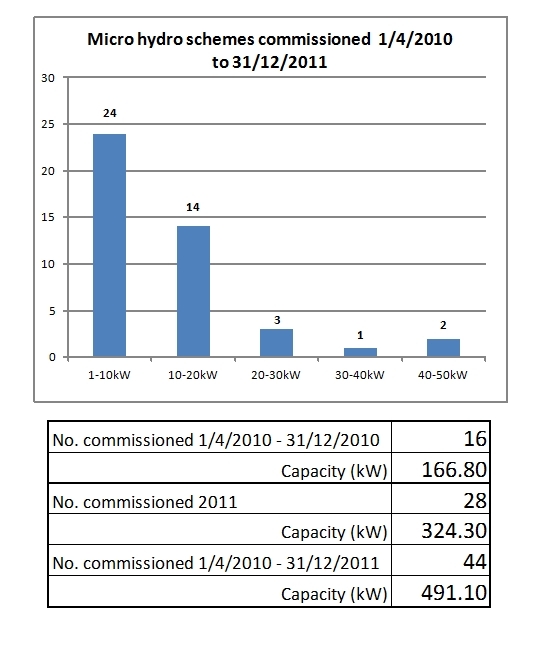 An intention has been expressed by DECC to sort these issues out by the end of December 2010. An MCS "standard" for installers has now been published following approval by the MCS Management Panel against the advice of several members of the MCS hydro working group experienced with micro-hydro. The yourfreedom consultation referred to in a previous item (4 August below) is closing today. Please follow this link and add any further comment or rating by the end of today (to rate or add a comment you must first register on the yourfreedom website - this is simple). I have added a comment about the alternative approach to MCS accreditation for micro hydro currently under consideration by DECC which would involve scheme design, and possibly site, inspection rather than product and installer accreditation. DECC have published further guidance concerning eligibility for the Feed-in Tariff for holders or seekers of government grants, for example under the Scottish Rural Development Programme (SRDP). 21 August 2010 CAUTIOUS OPTIMISM . . . . I have today received confirmation from the Department of Energy and Climate Change (DECC) that "We are currently looking into the legal and policy situation concerning alternatives to the MCS". I hope to be able to provide more detail soon. On 30th July the Coalition Government published its response to the web-based consultation which closed 10th June. This is a link to the response page concerning energy and climate change. 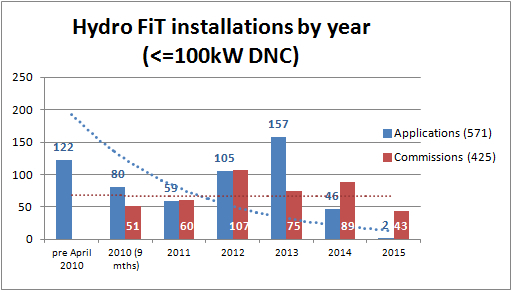 There were many representations concerning the Feed-in Tariff (FiT) and the MCS accreditation scheme but disappointingly there is no mention of this. However, a continuing consultation by the Coalition has now begun known as “Your Freedom” and a specific thread has started on the FiT/MCS issue. Please add your comments to this thread. As you will see from mine (theleme 3rd August), the discussions that have taken place with the MCS working group are in some disarray. I shall shortly be posting proposals for alternative approaches on the yourfreedom site and on the Micro Hydro Association site. The cut-off dates for applying for both installer and product accreditation have been extended - see MCS website. I have posted a response to the consultation on behalf of the mha as have several members independently. The full text of my response is here. The consultation closed on 10th June. The consultation period has been extended to 2nd July 2010. Many reponses to date are supportive of the proposed arrangements for micro hydro schemes or suggest more stringent measures including banning micro hydro development altogether. Is this sensible? If you think not, then here is where to respond: Hydropower Permitting Review. I wrote to Lord Hunt and others to request consideration of the problems that the micro-hydro community perceive with the MCS accreditation scheme and eligibility for the Feed-in Tariff. This is the response. The working group on hydro scheme standards, after some 6 months discussion, has decided to ask some of its members (some of whom are also members of the mha) to produce a total redraft. The aim is to devise something more appropriate to small schemes (under 50kW capacity). Once there is a viable draft standard for accreditation we will publish it on this website. Here are the consultation paper and the final response I have submitted on behalf of the mha. 29 March 2010 Letter to Lord Hunt and others concerning Feed-in Tariff and MCS accreditation scheme due to be introduced from 1 April. Here are the consultation paper and the draft response I would like to submit on behalf of the mha. Please contact me with your views mha administrator. The Engish/Welsh EA has also now published a consultation on hydro schemes. If you are reckoning to respond to this, please let me know mha administrator. The "statutory instrument" (S.I.) 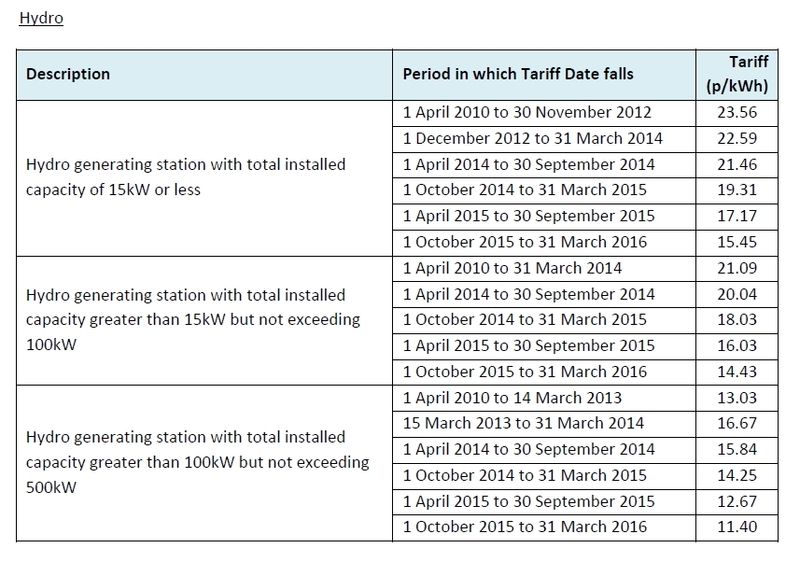 and accompanying notes which will bring in the feed-in tariff have just been published. They contain the clear statement that hydro installations under 50kW capacity must be accredited under the MCS scheme (both for products and for installers). This will be a problem for potential generators as there are no accredited hydro products or installers yet and very few with the resources or skills to implement schemes. We lobbied for the MCS accreditation requirement to be removed at least for a period, but this has proved ineffective or too late so far. There is now an office of renewable energy deployment (ORED) in DECC which will oversee the introduction and operation of the scheme and they state that they will be asking Ofgem to exercise discretion in the determination of eligibility for hydro schemes. One further item of interest in the S.I. is that hydro schemes where an export meter has not been installed will by default for this year receive an export tariff payment for 75% of their generated power. That proportion will be reviewed annually. The Scottish Environment Protection Agency (SEPA) has announced that there will be no increase in abstraction and impoundment fees for 2010-2011 (usually £588 for 1st scheme and £412 for additional schemes). This is some comfort but disappointing as some months ago SEPA waived fees altogether for a period. Please read letter and statement of concerns being sent to MPs and civil servants tonight, let us have your comments and lend your support by joining the association. If you haven't already done so, please consider signing this petition to No 10 - deadline 3rd June 2010. and this petition - deadline 2 August.